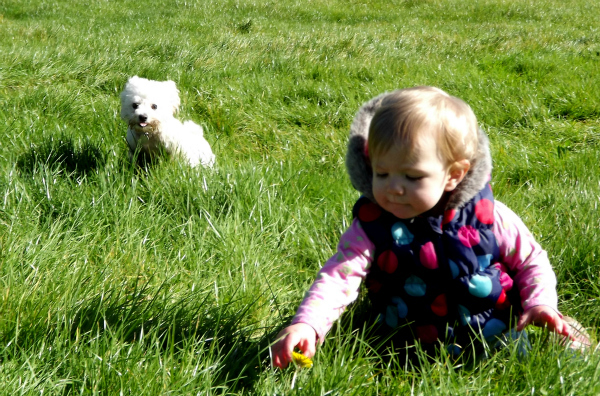 Kids and puppies – how to make it work! It’s something that nearly every parent will hear at least a hundred times whilst their children are growing up: “Can we please get a puppy, pleeeeease! ?” The benefits of growing up in a family which has a dog are plenty. Not only do they help teach empathy and responsibility, they also help to promote a healthy lifestyle. One medical study concluded that kids growing up in a family with a dog were much more likely to take regular vigorous exercise than those without. It seems a dog is one of the few things which can tear children away from their computer games! Here are a few tips for making sure that dogs and kids get along just fine! It’s hard to imagine that a cute ball of fluff could cause damage to anyone, but you’d be wrong. Even puppies can give a nasty nip, and although they are sweet natured for the main part, just like kids their moods are prone to change. You also have to consider the wellbeing of the dog. Puppies are just getting used to this big bad world, and they need their space and time to do that. By no means be afraid of letting your children and puppies play, but always keep a watchful eye. Dogs can get very possessive over their toys- just like some certain children that I know! Make sure that you keep the two separate- as parents we know that is easier said than done. Kids always want to play with the things they are not meant to- but you need to ensure that they know the dogs toys are out of bounds. It is unlikely that anything untoward would happen, but when it comes to kids and dogs it’s always better to be safe than sorry! You can shop for a huge array of toys especially designed to stimulate and engage dogs, as well as beds, treats and dog coats with Dogscorner.co.uk. All kids, whether they are growing up with dogs or not, need to be taught that animals must be treated with respect. Having fun with the family pet is one thing, but they need to understand that dogs are not play things. Teach your kids not to jump on their backs, pull at dog harnesses or leads, or put their hands close or into their mouths. All dogs have their limits and even the most docile will become aggravated if it’s constantly being pulled at- ensure your children know the boundaries. A really easy way to aggravate a dog is to get in the way of it and food! Always teach your children to stay well away if your dog is eating. Never allow your kids to pull food out of a dog’s mouth. Accidents can happen all too easily and even the friendliest of dogs can be put in a bad position if people start messing with their food. Children should never grow up to be fearful of dogs- but they do need to be respectful. If your kids have grown up with a friendly family pet it is understandable that they will assume all dogs will be equally receptive. Ensure that your kids know that strange dogs must be approached with caution. Never allow your kids to pet a stranger’s dog without first asking their permission. What do you think about kids and puppies? Is it a match made in heaven or just too much stress for everyone involved? If you have a puppy and children, how did you make it work? Disclosure: This post was brought to you by Dogs Corner. My children would love a dog, but I've said no until they are old enough to look after it, or we get a house with a bigger garden! I know all the hard would would end up on me if we got one now. I am tempted though. You had me at puppies! Sadly Papasaurus is anti dog but we are planning on getting baby guniea pigs next month! Here's a fact for you – I used to walk a cat on a harness…. A cat or your cat??? My cat! I mean I don't go round harnessing up random cats!